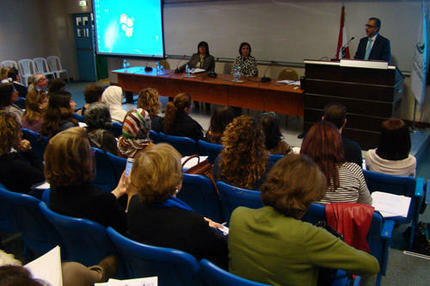 LAU hosts the Fourth Annual Symposium on the Teaching of Writing, bringing together more than 140 educators from across Lebanon. LAU Dean of the School of Arts and Sciences Nashat Mansour kicked off the event. Participants enjoyed the collegial learning atmosphere of the event. 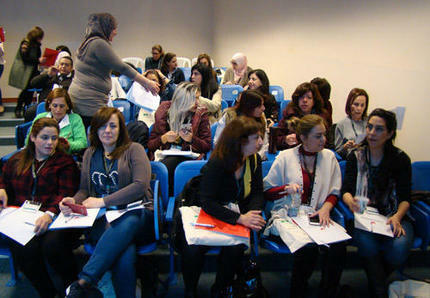 More than 140 teachers of English from schools and universities across Lebanon attended the Fourth Annual Symposium on the Teaching of Writing, organized by LAU Beirut on March 18 in collaboration with the American University of Beirut (AUB). The event, which included teachers from public schools for the first time this year, aims to improve the skills of teachers of English and to create partnerships between teachers and universities in order to promote research collaborations on the theme of teaching writing. Upon the request of participants in last year’s symposium, the 2017 focus was on writing assessment, a key issue for teachers, especially in public schools, according to Leila Koujam, teacher at Gibran Andraous Tueni public school. “We tend to be more generous in our evaluation than private school teachers, and we need to overcome this difference in order to better prepare all the students in the long run,” she explained. University professor Marian Omari found the workshops most rewarding. “We were able to share our experience, receive and give each other ideas. And the techniques discussed today were all very creative,” she enthused. As the event came to its conclusion, reports from the different sessions revealed the need for teachers to be better trained in common techniques and the importance of giving positive feedback to students. Of the many issues raised, standardized tests were deemed unfair to local students who come from multiple cultural backgrounds as they specifically target English speakers and a cultural identity not necessarily shared by all Lebanese students. Concerning the next symposium, teachers expressed their wish to work on the use of technology in class, as well as creative and collaborative writing. The benefits they drew from the event had most participants already save the date for next year. The annual symposium on the teaching of writing was initiated by the American University of Beirut in 2014 and has been organized with a different university ever since.